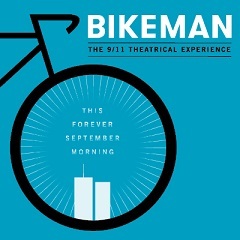 Previews of Bikeman: The 9/11 Theatrical Experience begin Sunday January 26 at the BMCC Tribeca Performing Arts Center, with 7.5% of every ticket after mandated deductions going to the 9/11 Memorial. The official opening is set for February 18, with Robert Cuccioli (Jekyll & Hyde, Spiderman: Turn Off the Dark) in the lead role. 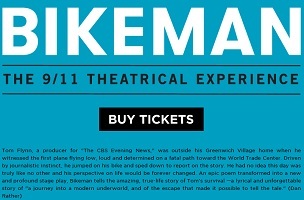 The one-hour show is based on a book of the same name by Thomas F. Flynn. At the time of the 9/11 attacks, Flynn was a writer-producer with the CBS Evening News with Dan Rather. From the starting point that fateful morning of his Greenwich Village home, Flynn headed to the scene on his bicycle after the first plane hit and quickly became much more than a mere reporter. Flynn recently completed writing his second murder mystery novel based on Cape Cod. He is also the co-author with his wife Nancy Reardon of [how-to book] On Camera (Focal Press). During his illustrious journalism career, Flynn also helped launch 48 Hours, worked as a producer on 60 Minutes with Steve Kroft and won six Emmys.